I don't have much of a green thumb, but somehow, my grocery store orchid is sprouting a baby orchid, also known as a keiki. I have been watching it grow for about six months and I think it is finally large enough to be removed and planted in it's own container. 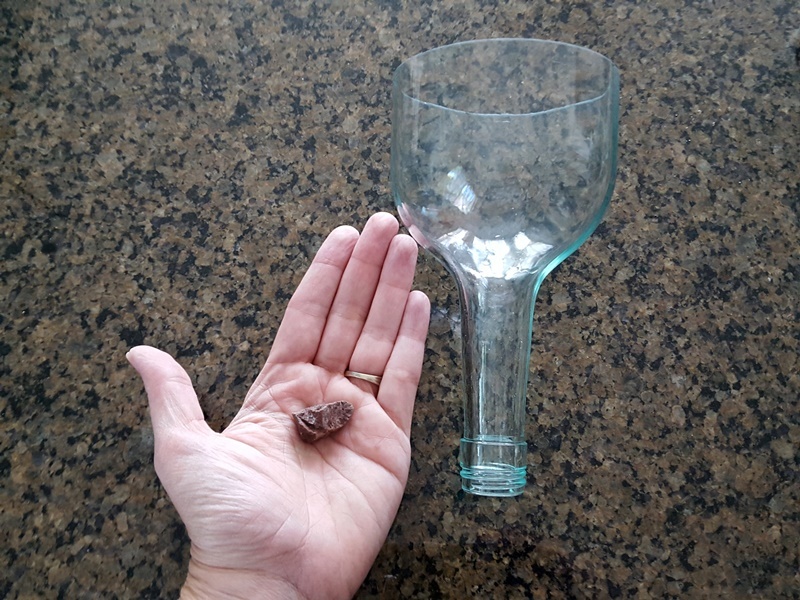 So, it's time to make a wine bottle vase. These vases are a clever way to recycle empty wine bottles. 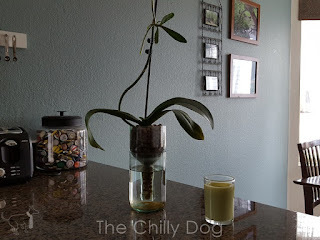 I have used them successfully for planting orchids, a variety of succulents and even a spider plant. 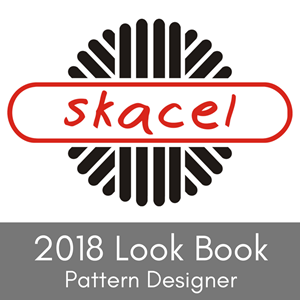 When you are choosing a wine bottle for this project, you don’t want one with a long tapered neck. It won’t set into the base of the bottle nicely. Look for a bottle with a short, straight neck. 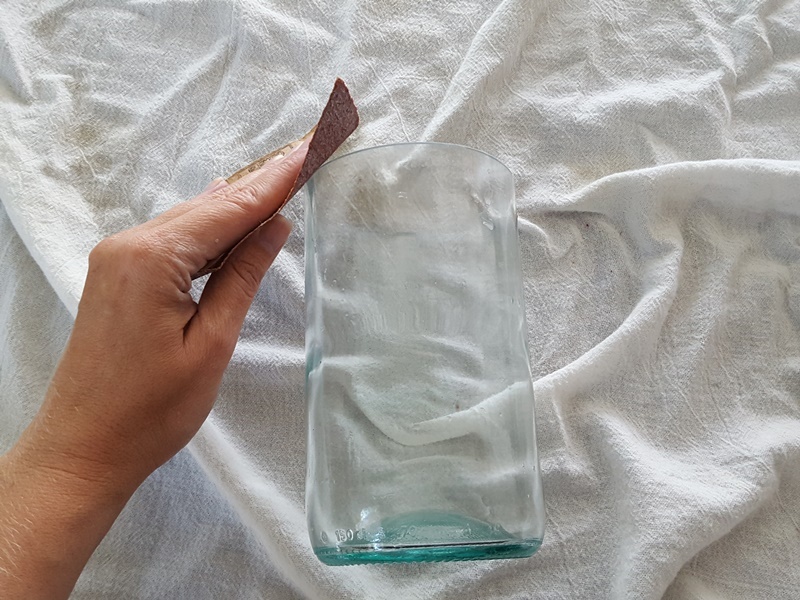 If this is your first time cutting glass, avoid bottles that have a large indentation, or punt, on the bottom of the bottle. Sometimes the punt is there to add structural integrity to the bottle and makes it a little trickier to cut. Also, I have found that clear glass wine bottles are usually a little bit thinner and easier to cut than colored glass. 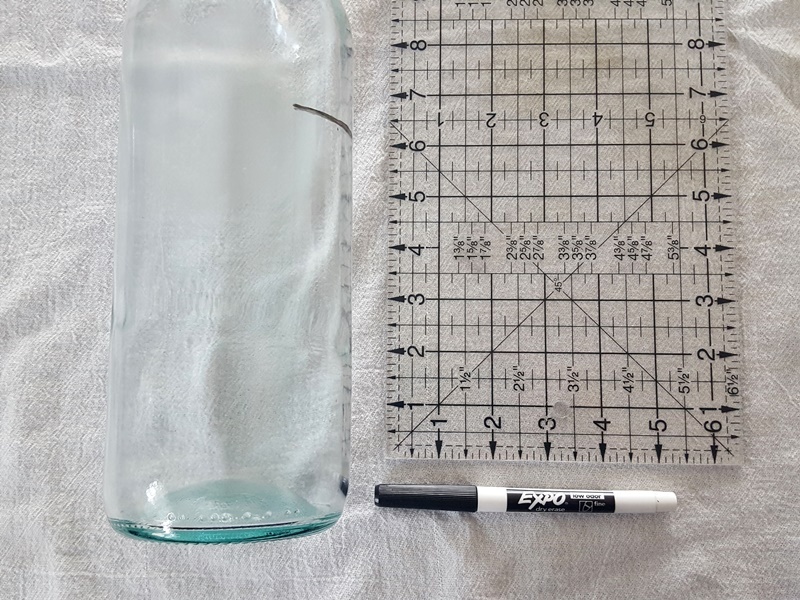 Over the years I have cut a lot of bottles and have about an 80% success rate. 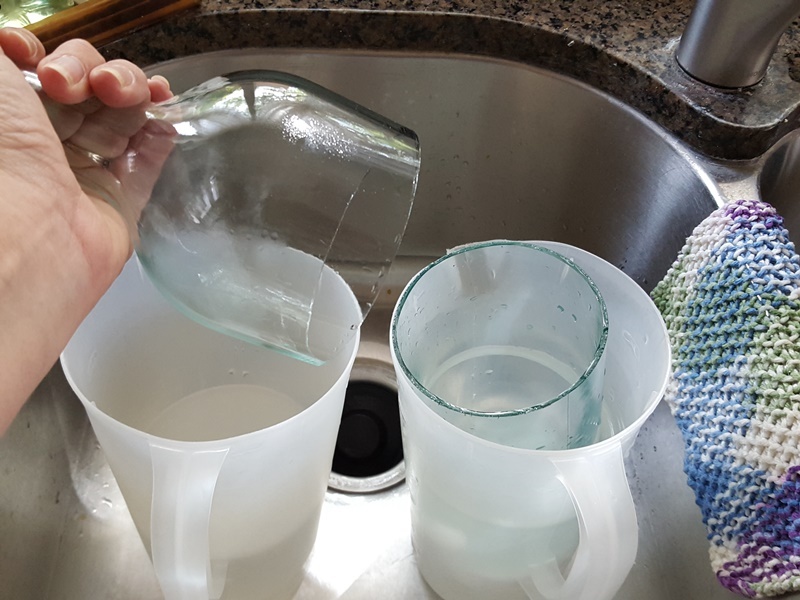 Glass can be difficult to work with. 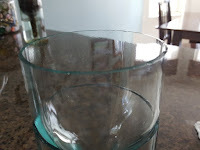 Imperfections in the glass can cause your bottle to break in unpredictable ways even if your technique is flawless, so have a couple extra bottles ready to go. 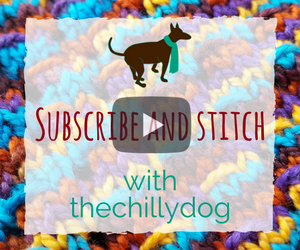 A little common sense warning - You need to be very careful while completing this project. 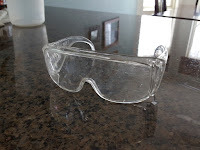 Not only can glass be very sharp, one of the water baths will have boiling water which is very hot. 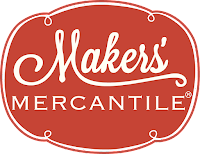 Also, containers you use for crafting, shouldn’t be used for food. When working with glass, ALWAYS WEAR SAFETY GLASSES! 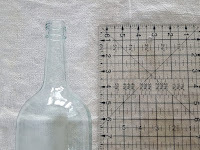 Measure your bottle from the top of the neck to where the sides begin to straighten out. For my bottle, that’s about 6 inches. 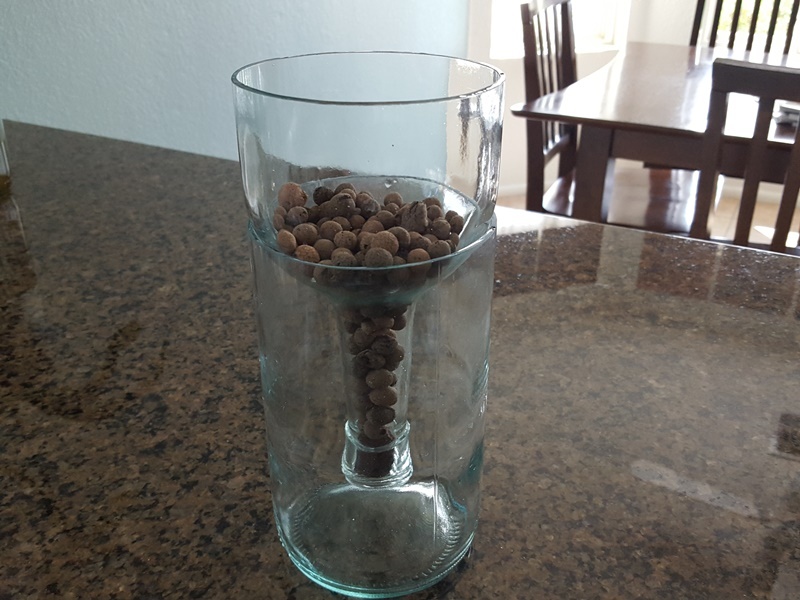 The bottom of your bottle will need to be at least that deep so the top can set inside it. 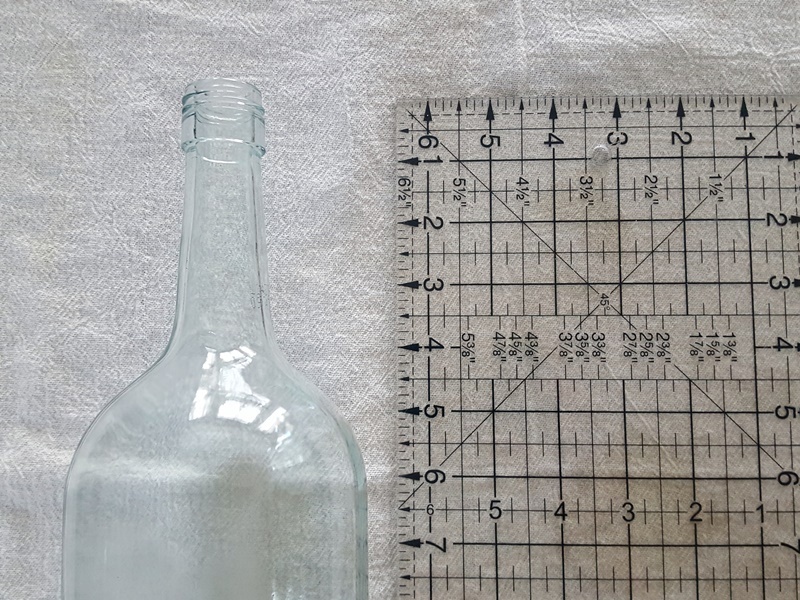 Measure the bottom of the bottle from the top of the punt (again, the flatter your bottle bottom, the better). Use a dry erase marker to mark where you will cut. I am cutting six inches above the indented punt. 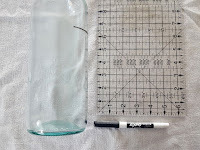 Place the bottle cutter on a flat surface and position it so the scoring blade is aligned with your mark and is at a right angle to the glass. Press the bottle firmly against the scoring blade and carefully rotate the bottle all the way around. You will hear a faint tearing sound. After scoring, you should be able to see a thin, but clear mark that goes all the way around the bottle. 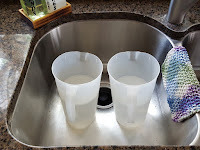 Place two plastic containers in a deep sink. Fill one container, about 3/4 full, with boiling hot water and the other with nearly freezing water. If your water baths are not hot or cold enough, the bottle will not separate. 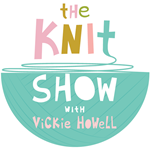 Hold the neck of your bottle and place in into the hot water so the water level is slightly above the score line. Keep the bottle submerged for about 10 seconds. Lift the bottle straight up and move it to the cold water for 10 seconds. Again, make sure the water level is slightly above the score line. If you listen closely, you will hear the glass making a cracking sound. Carefully lift the bottle straight up and move it from the hot to cold water for ten seconds at a time. 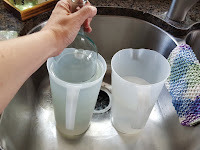 Be aware that the bottle will most likely separate as you are pulling it up to move it from one water bath to the other. You can use tongs to remove the bottle bottom from the water if necessary. STOP! 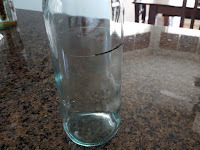 Once the bottle has separated your first instinct may be to touch the cut edge. 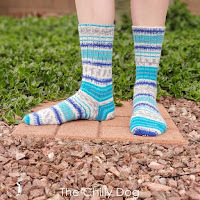 The edges can still be sharp and need to be sanded before you put your fingers on them. 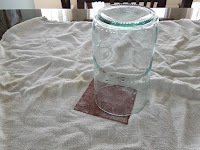 Rinse the edges of your bottle and wet a piece of sandpaper. Place the sandpaper on a flat, protected surface. Rub the bottle bottom over the sandpaper for several minutes until the cut edge is no longer clear. Rinse off any glass dust particles. Repeat for the bottle top. Next, you need to sand the outside and inside edges of the bottle top and bottom. Hold your sandpaper at about a 45 degree angle to the cut edge and rub all the way around the bottle. Again rinse the bottle pieces to remove any fine glass dust. Now the fun part, adding a plant. 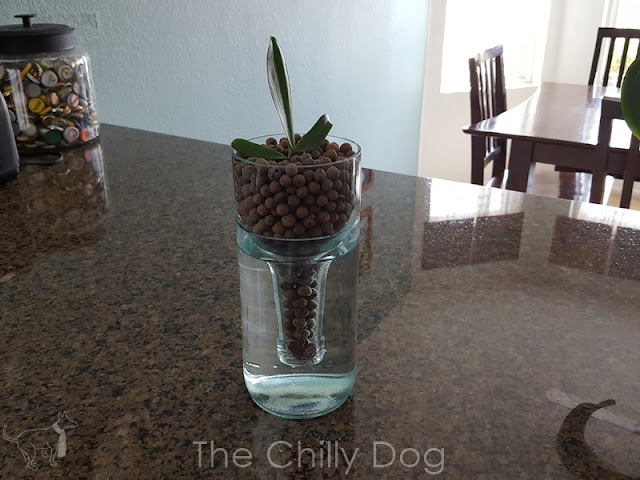 Find a small rock that can be dropped down into the neck of the bottle and wedged snuggly into the opening so that water can go up the neck, but no planting material can fall out. 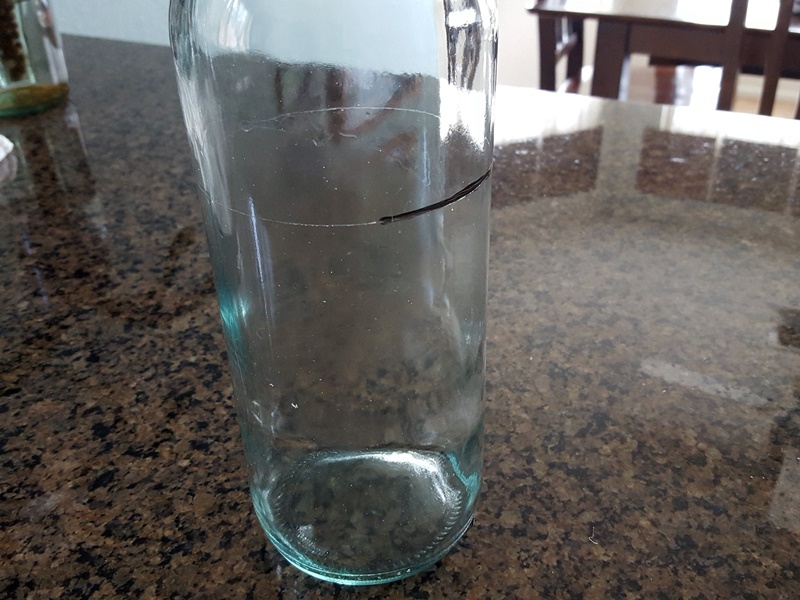 Place the neck of the bottle upside down into the base. Fill the neck with clay hydro balls. 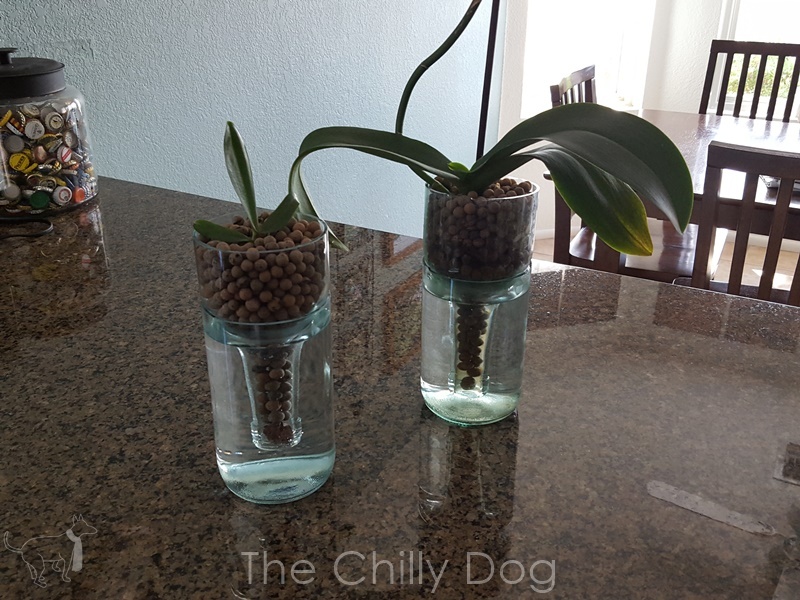 These help distribute the water into the top of the vase without flooding the plant. You can fill the remaining part of you vase either with soil or with more hydro balls and then your plant. 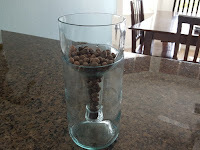 Remove the top of your vase and fill the bottom with water. Replace the top and enjoy! 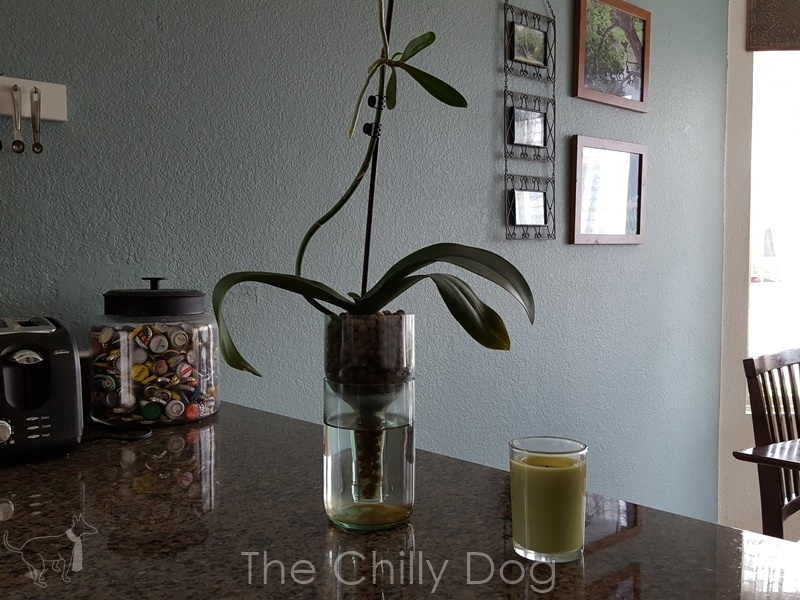 One of the benefits of using this type of vase is that you rarely need to add more water to your plant. However, from time to time you will need to remove the top of the planter, rinse out the bottom, and freshen up the water. 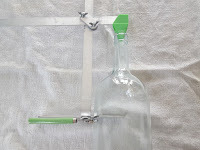 Learn how to cut wine bottles and make a self-watering, DIY vase.